Taoism were going around, and Ssu-ma Ch'ien himself was unsure of their authenticity. The biography in fact contains an account of not one but three men called Lao Tzu. The first Lao Tzu was a man named Li Erh or Li Tan, who came from the village of Ch'üjen in the southern Chinese state of Ch'u. Li Erh served as historian in charge of the official records in the Chinese imperial capital of Loyang. He was a peer of the famous Chinese philosopher Confucius (551–479 B.C.E. ), and he is reported to have given an interview to Confucius when he came to Loyang seeking information on the Chou ritual. 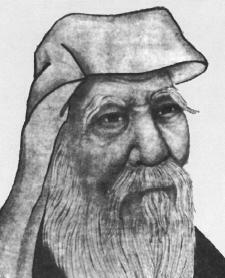 Another man identified as the founder of Taoism was Lao Lai Tzu, who also came from Ch'u. He is said to be a person of the same age as Confucius and is credited with a fifteen-chapter book explaining the teachings of the Taoist school. Nothing more is known about the second Lao Tzu. According to a third account, the original Lao Tzu lived 129 years after the death of Confucius. This man went by the name of Tan, the historian of Chou. Actually, it is impossible to prove the historical accuracy of any of these accounts. Lao Tzu is not really a person's name and is only a complimentary name meaning "old man." It was common in this period to refer to respected philosophers and teachers with words meaning "old" or "mature." It is possible that a man who assumed the pseudonym (assumed name) Lao Tzu was a historical person, but the term Lao Tzu also was used as a substitute title to the supreme Taoist classic, Tao te ching (Classic of the Way and the Power). According to Ssu-ma Ch'ien, Lao Tzu had been serving in the Chou capital for a long time. He became unhappy with the dishonest political situation and decided to go into retirement. As he was passing through the Hanku Pass west of Loyang, the gate-keeper stopped him and asked him to write down a book of his teachings. Lao Tzu then composed a book of five thousand sayings in two sections that described the theory of the tao and te. This book was then known as the Tao te ching. Lao Tzu is frequently associated with the other famous early Chinese thinker, Confucius. There are numerous stories about debates that supposedly took place between these two great philosophers in which Lao Tzu was always the winner. These stories are undoubtedly anti-Confucian publicity circulated by members of the Taoist school, perhaps as early as the fourth century B.C.E. Lao Tzu's Tao te ching itself is a collection of sayings describing the principal Taoist teachings. Most scholars now agree that Lao Tzu did not write this book, mainly because no one knows whether he was a historical person. The most convincing theory is that there were a large number of proverbs (wise sayings) that were part of the Taoist teaching. They were memorized and passed on from teacher to pupil. Eventually the best of these sayings were collected and edited into the book, which was then given the title Tao te ching. A study of the style and grammar of the work reveals that it must have been put together around the fourth century B.C.E. Lao Tzu's Tao te ching has confused its readers for centuries. Its language is extremely short and unclear. Much of the text is rhymed. Although the work is divided into chapters, the passages in a chapter do not always refer to the same subject. Thus, it hardly qualifies as a well-organized book of philosophical teachings. The most important concept developed in Lao Tzu's Tao te ching is tao. Tao literally means "road" or "way." In the Tao te ching it is portrayed as something that cannot be expressed, a concept beyond definition. "The way ( tao ) that can be told of is not the constant way." Tao is so indescribable that the term itself is often not used and is referred to only indirectly. Tao stands as the force behind the universe. There is even an indication that it is the universe itself. An important quality of the tao is its "weakness," or "submissiveness." Because the tao itself is basically weak and submissive, it is best for man to put himself in harmony with the tao. Thus, the Tao te ching places strong emphasis on nonaction ( wu wei ), which means the absence of aggressive action. Man should not strive for wealth or fame, and violence is to be avoided. This peaceful approach to life was extremely influential in later periods and led to the development of a particular Taoist way of living that involved special breathing exercises and special eating habits that were designed to maintain calmness and harmony with the tao. Heider, John. The Tao of Leadership: Lao Tzu's Tao Te Ching Adapted for a New Age. Atlanta: Humanics New Age, 1985. Kohn, Livia, and Michael LaFargue, eds. Lao-Tzu and the Tao-Te-Ching. Albany: State University of New York Press, 1998. Lau, D. C. Lao Tzu: Tao Te Ching. Baltimore: Penguin Books, 1963. Lao Tzu. Tao Te Ching. Edited by James Legge. Mineola, NY: Dover Publications, 1997. I love Lao Tzu's quote: "A journey of a thousand miles must begin with a single step" It has such a meaningful message, and the fact that it has survived over a thousand years, and people still learn from it today is remarkable!!! Im so glad that I came upon this message, I will remember it forever :)Thanks to the people who published this article, So glad that I got to find more out about this incredible man in history!